An attachment can be added to a note at any time. Attachments are stored with the note on which they were added. To view all documents attached to a property, click on the Documents sub tab (for more information on using this tab, click here). 1. Click the Add Attachment button. 2. A browsing screen will appear. Click the Browse button. 3. Locate the file you wish to add and double-click it. 4. Once all files have been selected, click the green Add button. The attachment(s) will display in the note as seen below. 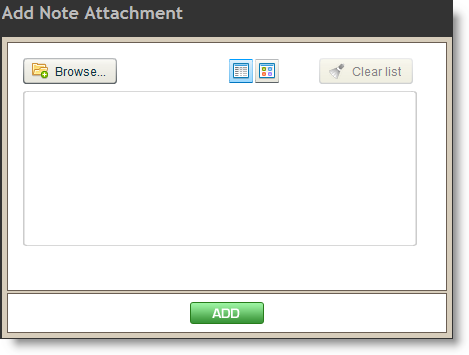 Attachments can be renamed by double-clicking on the document name in the Attachments box (shown highlighted above). Attachments can be downloaded by clicking the green arrow or deleted by clicking the trash can icon. 5. All documents added into Broker Brain can be accessed from the tab on which they were added, but they are also collectively stored in the Properties > Documents tab, in either the Documents section or the All Attachments section (as shown highlighted below). In the screen shot above, note that adjacent to the attachment name is a field that says No Type. If you leave the type set as No Type, the document will be kept in the All Attachments sub tab. If you specify a type, it will be stored in the Documents sub tab, under the category you select. Additional types can be added in Admin>Types under the Documents tab.